SÃO LUIS, Brazil, Mar 21 2014 (IPS) - “We are victims of progress,”complained Osmar Santos Coelho, known as Santico. His fishing community has disappeared, displaced to make way for a port complex on São Marcos bay, to the west of São Luis, the capital of the state of Maranhão in Brazil’s northeast. 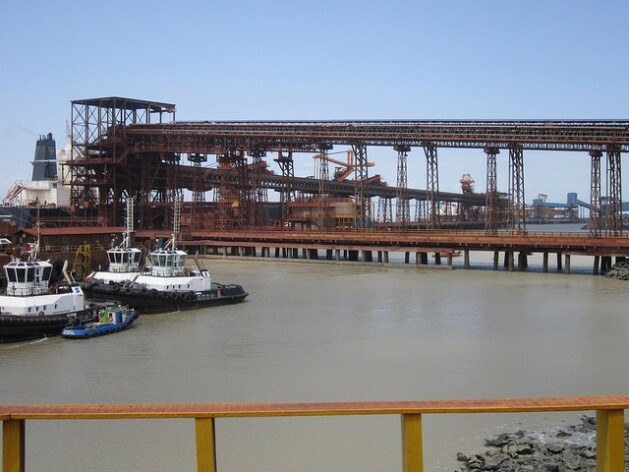 The Ponta da Madeira maritime terminal, which has been in operation since 1986, has strengthened the influence of its owner, the giant mining company Vale, in São Luis. The terminal currently exports 110 million tonnes a year of iron ore, consolidating a logistical corridor of decisive importance for local economic development. The 23-metre draught in Ponta da Madeira allows Valemax ships to dock in the harbour. They are the largest mineral cargo vessels in the world, with a capacity of 400,000 tonnes, and have been in operation since 2011. China, the principal customer for Vale’s iron ore, should be the main destination of these megaships, but it banned them from its ports as too large. However, a Chinese shipyard is building 12 of these vessels for Vale. South Korea is building another seven. Vale’s goal is to have 35 Valemax ships, 16 of which would be chartered. Their size cheapens transport costs and helps the company compete with Australia, a mining power that is closer to the large Asian market. Moreover, the giant ships reduce greenhouse gas emission per tonne of mineral transported by 35 percent, Vale said. uses transfer stations in the Philippines, and will shortly open a distribution centre in Malaysia to transfer goods to smaller ships. Two Brazilan ports and six abroad currently accept Valemax vessels. Company trains arrive at the port, transporting minerals from Carajás, a huge mining province in the eastern Amazon region that has made Vale the world leader in iron ore production. The port also exports a large proportion of the soya grown in the centre-north of Brazil. Beside it, a Vale plant converts iron ore to spherical pellets. These activities create thousands of jobs, especially in Vale’s area of direct influence, Itaqui-Bacanga, an area of 58 poor districts in the southwest of São Luis. Young people aspire to work there because the pay is good, and Vale’s human resources policies, inherited from its long life as a state company (1942-1997), guarantee job stability. An employee “is only fired if he or she really messes around a lot,” an executive told IPS. Vale also offers a lot of temporary work for the expansion of the port, and its railroad track, so far one-way, is in the process of being made two-way, with the aim of doubling mining exports from 2018. Because of these and other local projects, the economy of the surrounding neighbourhoods is booming, said George Pereira, the secretary of the Itaqui-Bacanga Community Association (ACIB). Three plants are planned, for pulp and paper, cement and fertilisers, as well as a coal-fired thermoelectric station, among others. Some 55 kilometres further south, in the municipality of Bacabeira, the state oil company Petrobras will build the Premium I refinery, which will be the largest in Brazil when it opens in 2018. The project will be put out to tender in April, and at its peak will employ 25,000 workers, the company says. The employment boom boosts consumption, trade and services, “but this is not the development we want. We have more money in our pockets but no water to drink, because the rivers are polluted,” Pereira said. Sanitation, drinking water, transport, teachers and doctors are scarce, while there is an excess of violence, drugs and prostitution in the poor districts, where the population is soaring, he said. Close to 200,000 people already live there, and two more housing estates are under construction, he said. In this context, Vale “does good works, but in isolation, without transformative programmes to develop the entire area,” Pereira criticised. The priorities are education and sanitation, he said. Ironically, the association that criticises and puts pressure on Vale is its own creature. It arose from the company’s social investment, required by the state National Economic and Social Development Bank (BNDES) as a condition for financing the iron ore pellet plant. ACIB is governed by representatives of the five divisions that make up Itaqui-Bacanga and was created 10 years ago to mobilise the local population for an urban clean-up project. Its overheads and its headquarters, a two-story building, are funded by Vale, Pereira said. Among the company’s numerous social action projects, some are outstanding for their effectiveness, such as extensions to the Itaqui-Bacanga Centre for Professional Education, an educational centre belonging to the National Industrial Apprenticeship Service (SENAI). This year the centre is providing technical education for 10,000 students, twice the enrolment it had in 2013 and five times that of 2010, thanks to 14 new classrooms and five new laboratories. Three other centres along the corridor between Carajás and São Luis are supported by similar partnerships between Vale and SENAI, Janaina Pinheiro, Vale’s human resources manager, told IPS. In 2013, SENAI trained 65,000 students in Maranhão, compared to 10,000 a decade ago, state director Marco Moura told IPS. Industrialisation in São Luis is concentrated around the ports on São Marcos bay. Near Ponta da Madeira is the state port of Itaqui, which has handled cargo of all kinds since the 1970s, and this year will see the addition of a grain terminal to export soya and maize from the new agricultural frontiers in the centre and north of the country. Some of Brazil’s new ports were created with the goal of becoming industrial hubs, including Suape and Pecém, in the northeastern states of Pernambuco and Ceará. They were planned as industrial-port complexes and have been boosting the local economies for the past decade. Both these ports have Petrobras refineries, and Suape has a petrochemical plant and eight shipyards, while Pecém has a steelworks and electricity generating plants. Many companies are locating in the enormous industrial zones on the landward side of the two ports. The São Luis ports were unconnected to that wave of industrialisation because they belong to the poorest Brazilian region, which is backward and neglected compared to other hubs in the northeast. The bay’s deep water, suitable for large-draught vessels, its location facing the North Atlantic, and the Carajás railway link, were advantages for the Ponta da Madeira terminal. But there have been victims, the 73-year-old Santico reminded IPS, for instance “between 80 and 100” artisanal fisherfolk from Boqueirão, who were evicted from their fishing village on the beach and resettled in different districts. A few years later, many of them have returned to fish in the São Marcos bay, in spite of this being banned, and they have settled on a small stretch of beach not occupied by the port, he said. “We had no other trade, and we were hungry,” he said. They eventually built eight rough cabins from poles and palm leaves, some for living in and others just for fishing equipment. Santico has a house in a nearby district and a cabin on the beach for the gear he uses for his sporadic night-time fishing expeditions. “There are hardly any fish left, and only a few prawns,” after new underwater concrete breakers were built to control tidal currents, he said. As a result, fisherfolk negotiated with Vale and three years ago the company donated food baskets for 52 fisherfolk, worth between 308 and 725 dollars. “That’s how we survive,” Santico said. Thousands of other families were evicted to make way for docks and port installations. Itaqui was, in fact, the name of a district that disappeared. More city districts are now threatened by the industrial zone under construction next to the highway. Vila Maranhão fears extinction, squeezed between the railway and the new industrial hub, and only a few kilometres from a coal-fired thermoelectric plant, a large aluminium industry and stockpiled minerals. 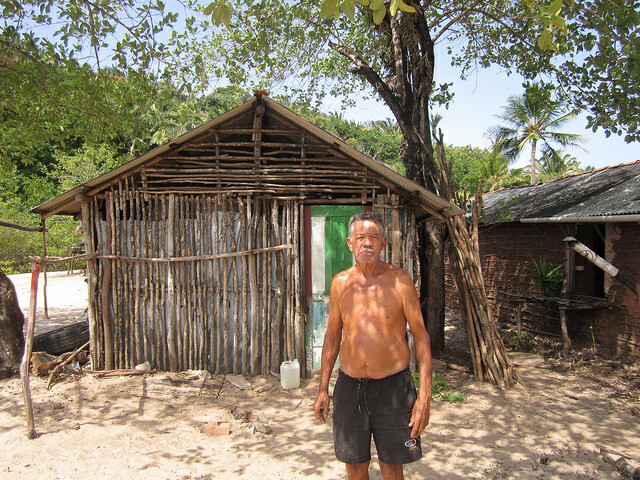 “There is no official word yet, but it’s only a matter of time before we are evicted from here,” predicted Lamartine de Moura, a 71-year-old ACIB director who has lived in Vila Maranhão for 23 years. “If we’re not forced out by expropriation, we will be by the pollution,” she told IPS. A university study found heavy metals in the local stream, and mineral dust in the air stains the houses and spreads respiratory diseases, she said.